Last year, Seattle was America’s sixth-fastest-growing city, according to Forbes. Much of that growth has involved tearing down old buildings and putting up new high rises, a process that often sacrifices beauty, tradition and sustainability in the service of increased density. Now, however, more developers are confronting the distinct challenges and rewards that come with extending the lives of old buildings through modern retrofits. While these projects can be more complex, often requiring extensive seismic and energy upgrades, retrofits can reduce the carbon impact of building construction, maintain diverse and thriving neighborhoods, and contribute to a sense of community and city pride. Seattle has a core group of advocates for older buildings, many of whom have taken their talents to the already dense and desirable Capitol Hill neighborhood and the downtown corridor. For instance, Michael Malone, principal of Hunters Capital LLC, bought the Sorrento Hotel 33 years ago when it was in danger of being torn down for condominiums; he now owns a number of buildings in the Pike/Pine corridor, including the structure now housing The Elliott Bay Book Company, as well as several of the former automobile showroom buildings that dominate the neighborhood. And Liz Dunn, of Dunn and Hobbes, founded Preservation Green Lab (PGL), a department of the National Trust for Historic Preservation that works with cities and environmental organizations to incorporate reuse of buildings into those cities’ larger sustainability goals. “We’re at this really neat inflection point in building design and technology where we have all the strategies available to do high design married to the strengths of the building,” says Ric Cochrane, associate director at PGL. In early 2012, PGL released The Greenest Building: Quantifying the Environmental Value of Building Reuse. The report, nearly 100 pages long, made a detailed analysis of buildings in four climate zones and concluded that in almost every case, reusing an existing structure offers an environmental saving when compared to demolition and new construction. Seattle is also a participant in the 2030 Challenge, one of many global efforts to reduce the impact of the building sector on climate change. Launched in September 2011, the Seattle 2030 District describes itself as “an interdisciplinary public-private collaborative working to create a groundbreaking high-performance building district in downtown Seattle.” In many cases, it is doing so by upgrading existing structures to meet current energy standards. Seattle’s Dexter-Horton building, a historic downtown landmark that falls within the 2030 District, is a retrofit success story. 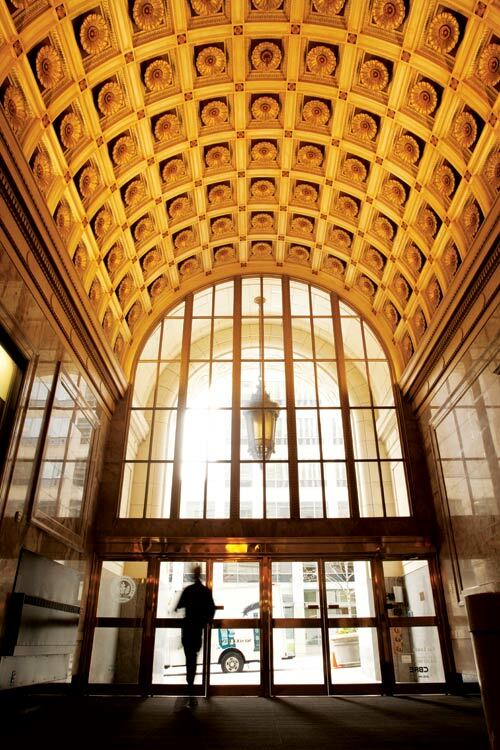 Opened 90 years ago, the 15-story office building at Second Avenue and Cherry Street is appreciated for its white terra-cotta exterior and stately columns. The building’s management team invested in significant upgrades in 2006, bringing the structure from an energy rating of 60 to 78 within one year and, eventually, to its current rating of 96, meaning it performs better than 96 percent of similar buildings nationwide. Low-flow water fixtures and light sensors helped achieve a LEED-EB Gold certification. Most of the retrofits began generating net savings within three years, and the building team says lower operating costs have made the space desirable to tenants and have kept the building competitive in a tight market. In an era when energy was neither cheap nor abundant, Lee explains, it made sense to maximize daylighting with larger windows and greater distances between floors. The Dexter Horton Building is shaped like a capital “E” with an extra arm, so daylight can penetrate into much of the office space. Paired with smart sensors that can turn lights up or down as needed, good daylighting makes it easy to keep electrical costs from skyrocketing. Natural ventilation, when supplemented with modern systems that carefully control heating and cooling, is another asset. “A lot of times, successful green retrofits rely on returning a building to its original functionality,” Cochrane says. But retrofits are sometimes significantly cheaper than building new. Jonathan Heller, an engineer at the Seattle consulting firm Ecotope, says it handles two types of older buildings: those with historic characteristics that make them desirable, such as exposed beams and brick construction, and others that are less charismatic but can still be renovated to a high standard of energy efficiency. The Bremerton architecture firm Rice Fergus Miller turned an abandoned 1948 automotive center in downtown Bremerton into one of the most energy-efficient office buildings in the nation for $105 per square foot, Heller notes. That’s less than half the cost of new construction. The building now has a LEED v3.0 Platinum rating. He also points to the King County Housing Authority’s new central office building, a renovated strip mall in Tukwila redone for $95 per square foot. Ecotope estimates the green upgrades incorporated into the building redesign will save $35,000 per year in operating costs and 890,000 pounds of carbon dioxide emissions annually. Old buildings are part of the fabric of the city and they are, to some extent, irreplaceable. Although today’s world economy allows builders to use materials manufactured thousands of miles away, structures from 100 years ago are likely made with wood and brick that was locally sourced. “There’s natural tension between keeping some of the history versus doing something new,” Shapiro observes. King Street Station is one recent example of that synergy. The 1906 structure is an iconic piece of Seattle history, but it suffered through multiple remodels that hid the original ceiling and removed historic lighting and plaster. After the City of Seattle bought the station from Burlington Northern Railroad in 2008, a team of architects, engineers and designers embarked on an ambitious renovation, restoring historic elements such as the ornate ceiling and 12-story clock tower, bringing the station up to code seismically, and updating electrical, mechanical, plumbing and fire protection systems. The building received a 2014 Honor Award from the American Institute of Architects and a LEED Platinum certification.